The adventures of Teddy LC Bear! Contractor Myth Busters – # 10! Hi all! Teddy is back after an extended leave – aka busy, busy, busy! In thinking about what to share with our followers, Teddy thought, “let’s help our friends become savvy ‘before’ they hire a contractor – TLC Construction or anyone else. So Teddy is going to use the blog to run a series of common thoughts about contractors explaining why they are myths. 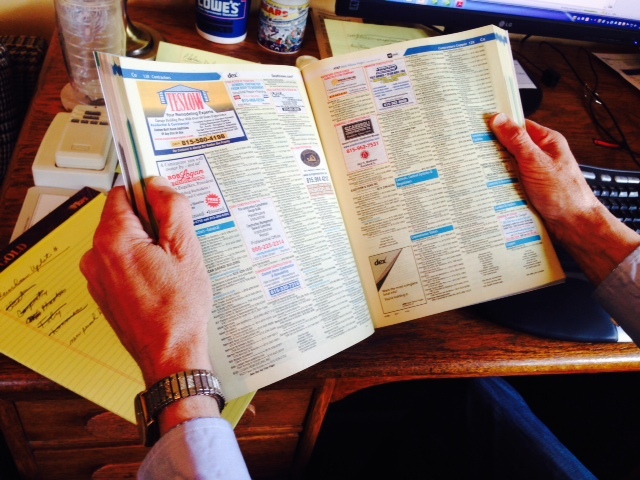 #10 Contractor Myth Buster – “Only look for contractors in the phone book, yellow pages or comparable internet sites.” “Yikes!” thought Teddy. “TLC Construction has never advertised in any of these places.” He decided to ask the owners where they get their customers if not through these venues. John Bowman, one of the owners of TLC Construction, explained how many of our customers are referred by previous customers; some are repeat customers; and others are referred by people who know, like and trust TLC and tell their friends. Others find TLC through its’ webpage; social media sites; referrals from a TLC supplier or subcontractor; or by talking to the owners, John or Jan.
“Great!” thought Teddy. “That explains why they have been in business for over 12 years!” Join Teddy next time to see TLC Construction ‘bust’ another myth about contractors! After a huge farewell, Teddy’s cousins took off their TLC attire (to save for their next visit) and headed back to the North Woods. Teddy was sad to see them go but knew he had to get back to work as TLC Construction had several projects that needed his input. Join Teddy next time to see how TLC Construction is helping someone turn their dream into a reality! Happy September! Teddy had a busy summer but is settling down and back to blogging. TLC Construction has several new projects but one that really sparked Teddy’s interest. 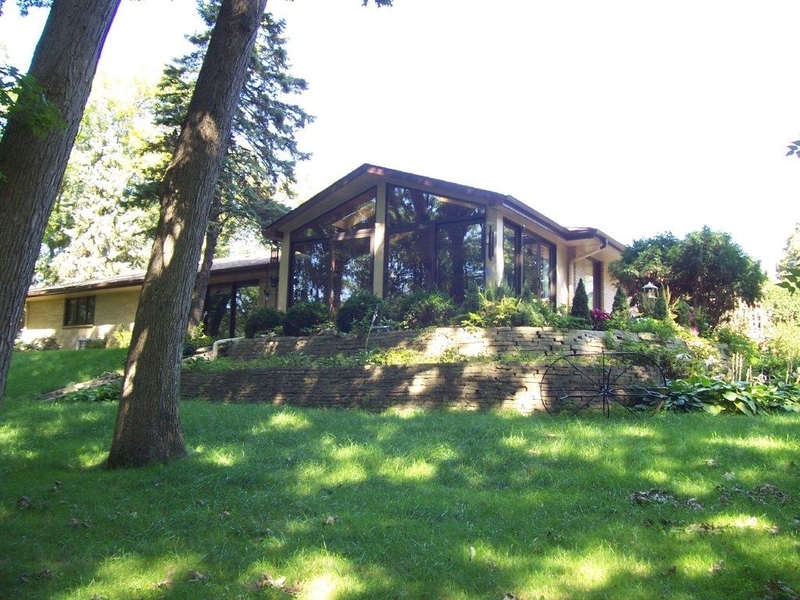 The home is nearly 50 years old and most of it has not been updated since the 60’s. Yikes! thought Teddy. It really isn’t configured for today. Families live differently and want different things. 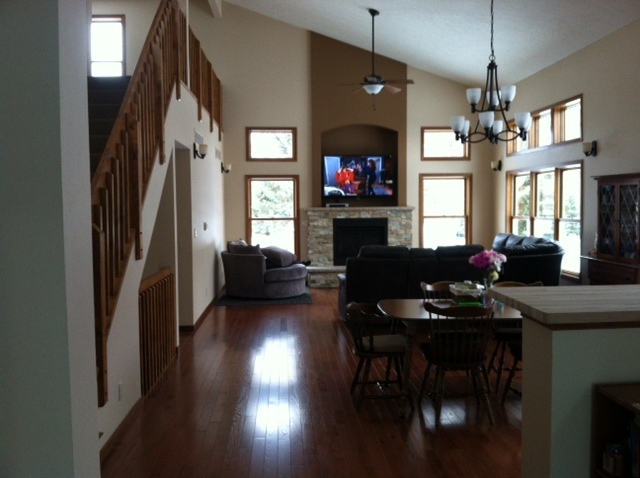 The buyers asked TLC to be creative and help ‘update’ the home. 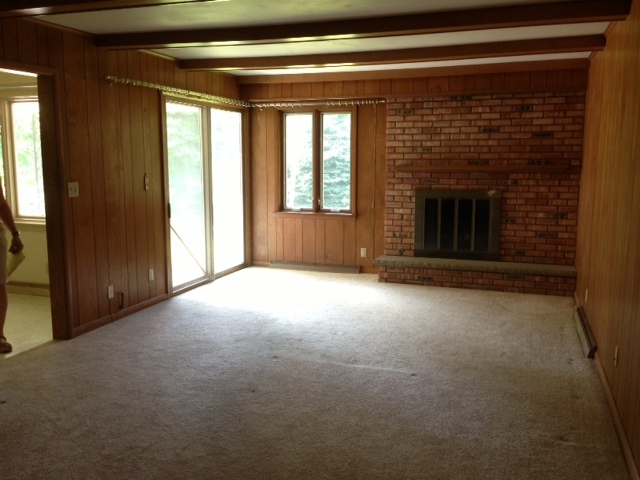 One major area of concern is the family room/kitchen. 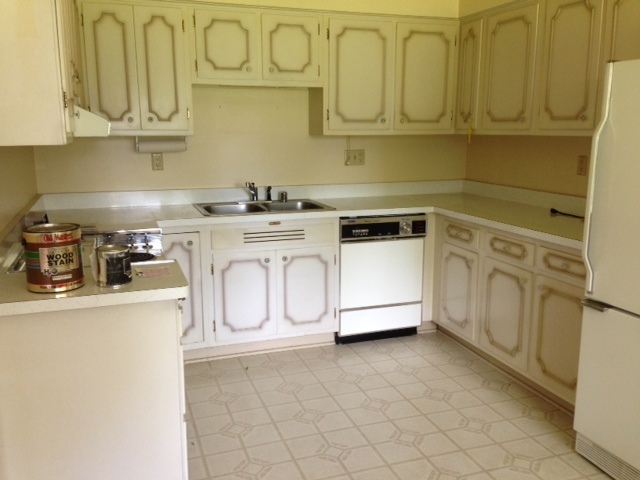 As Teddy saw – straight out of the 60’s and in desperate need of new cabinets, floor and most appliances! The kitchen opened to the family room; on the north side of the house; and was dark and closed off. The TLC contractors thought of taking the wall down between the two rooms and opening up the area. Structure wise, it was possible. It appeared the mechanicals (heating, electrical and H/VAC) could be altered to work. The buyers were in total agreement. Teddy couldn’t wait for the demolition to see what the entire space looked like and how creative the TLC contractors were in reconfiguring it! Join Teddy next time to see how this TLC Construction project is progressing! 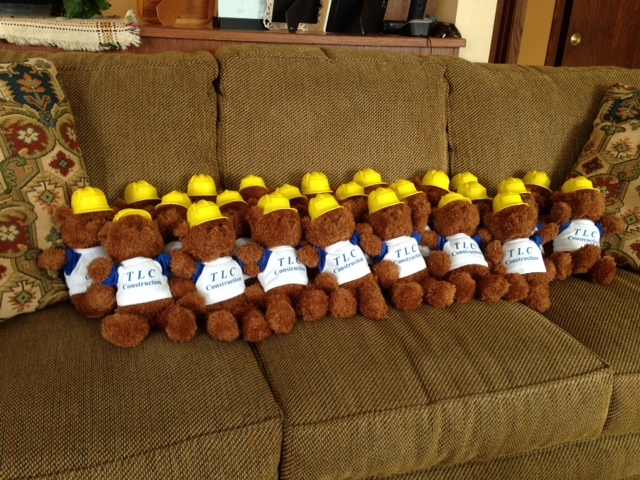 Teddy is excited the basement build out TLC Construction has been working on is finished! 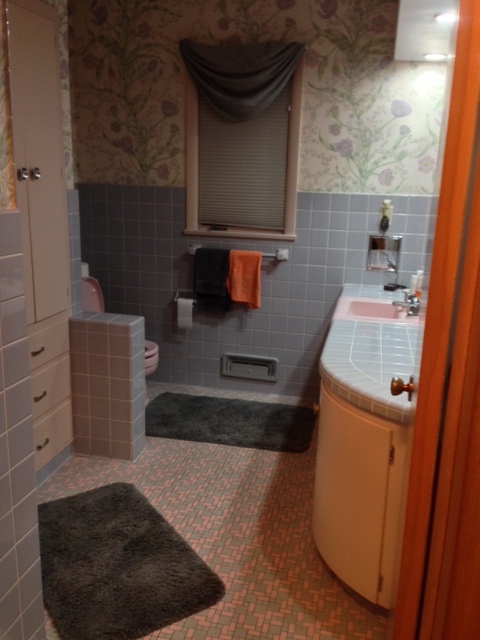 Despite the six-week delay, due to the need of adding interior drain tile, the project is ready for the family! 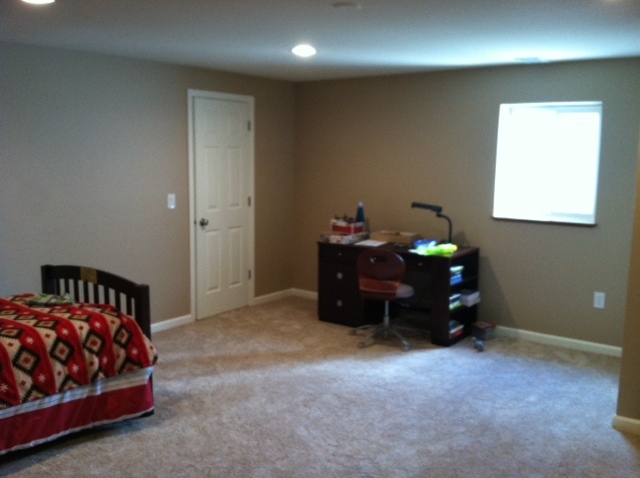 Now, in the very dry space, the son is moving into his new bedroom and enjoying his bathroom. All the kids and Mom are loving putting things into the family room and sharing bathroom! The homeowner is very excited to see how the project has come together! Teddy thinks it looks pretty cool too! 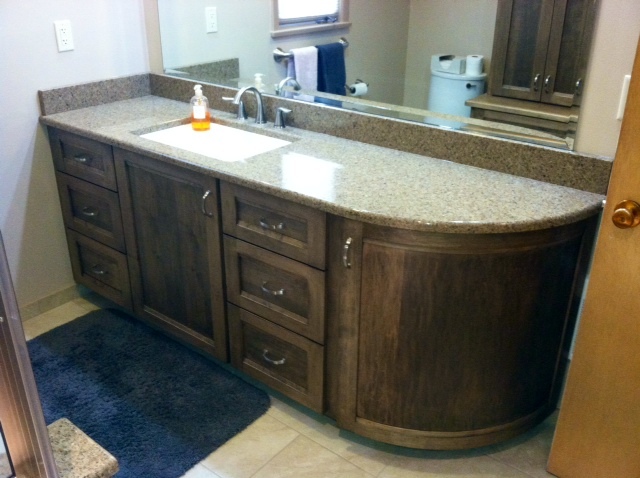 One big concern when thinking of remodeling or a new construction project is the selection of materials. Customers worry about: where do we buy them; how do we select items that go together; what determines quality; and more. At TLC Construction, a contractor assists the customer by arranging appointments; accompanying them to visit select suppliers; and guiding them in picking out materials – the granite, cupboards, fixtures, flooring and more. This can be a great help in reducing some of the stress in a building project. 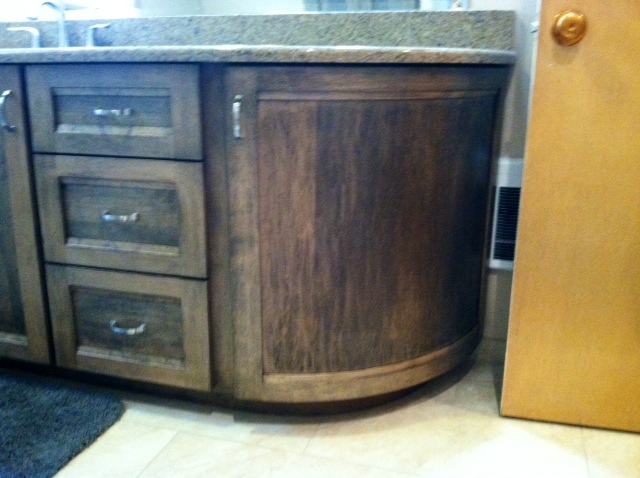 Join Teddy next time to see the progress in a new project in which TLC is opening up the kitchen to the family room. Teddy and the TLC Construction contractors would love to discuss making your home more livable; adapting it to your particular situation; or even just updating and making it more beautiful. Contact TLC today! Teddy is so excited as finish work is really progressing at the basement build-out TLC Construction is completing consisting of a play room, bedroom with walk-in closet and bathroom. The bathroom is looking beautiful! 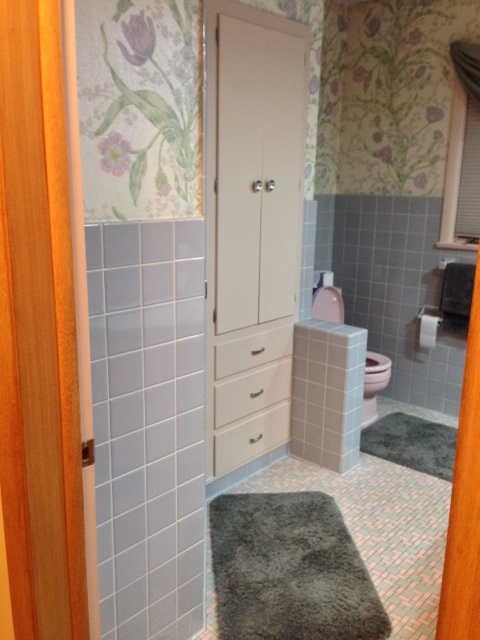 The subtle design in the ceramic tile is brought out by the 3 rows of 3′ x 12′ glass tile. 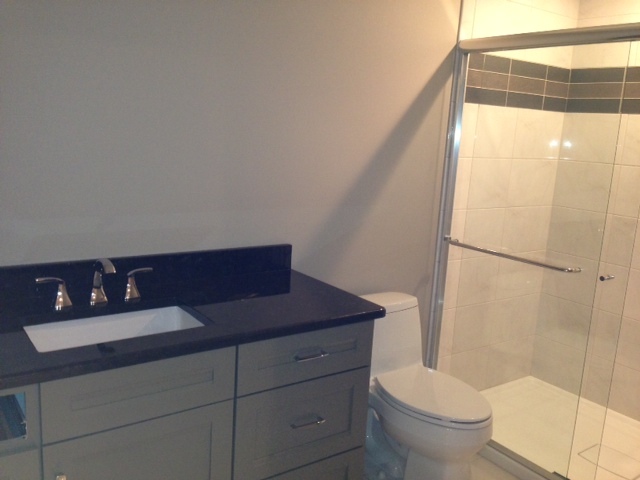 A painted, custom vanity and granite counter top connect and accent the glass tile. 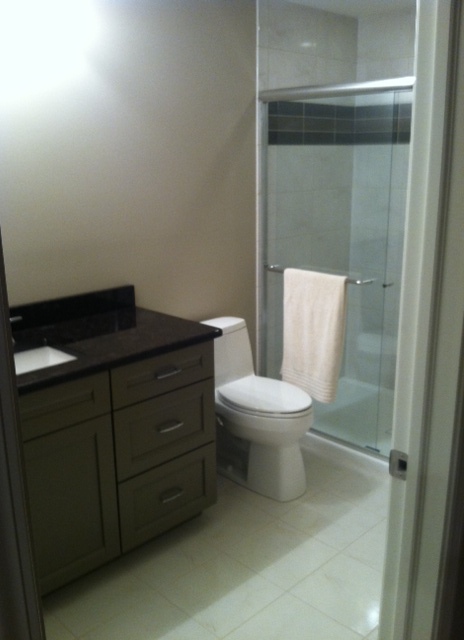 The clear shower door allows the beauty of the tile, granite shelf and chrome faucetry to shine! 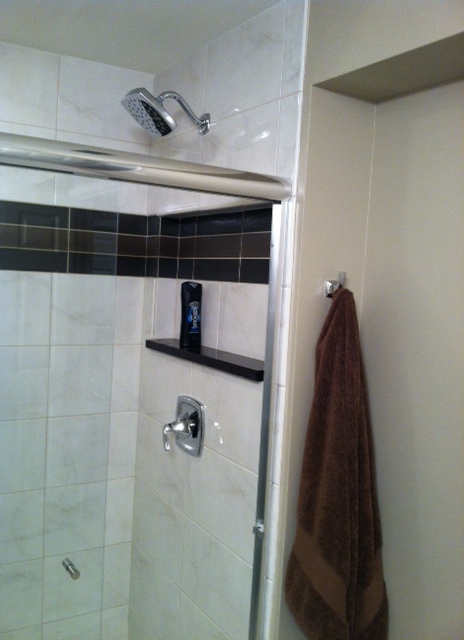 Chrome fixtures and a granite shelf also set off this 3′ x 5,’ contemporary, easy to care for shower. Teddy loves the coordination of all the different textures and colors! He is even more excited that the family is already using the new area! Join Teddy next time to see more TLC Construction finish work! Teddy has been on vacation with the TLC Construction owners. He was going to see his family in the North Woods. However, when the TLC owners said they were going to Canada, he decided to tag along and visit the relatives later in the summer. 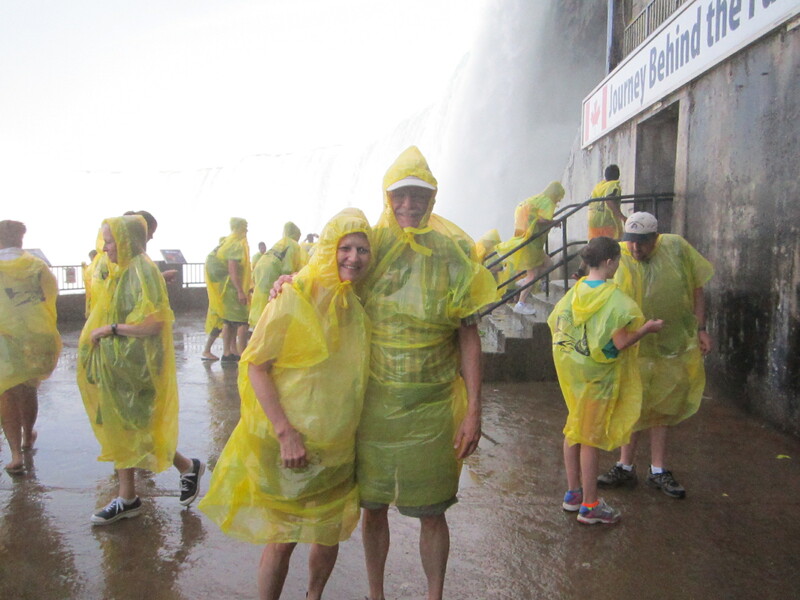 The Canadian trip took them to Niagara Falls. Teddy took the picture! Then on to Toronto and Casa Loma, a “castle” built between 1911 and 1913 for $3.5 M that included indoor plumbing and what indoor plumbing it has! 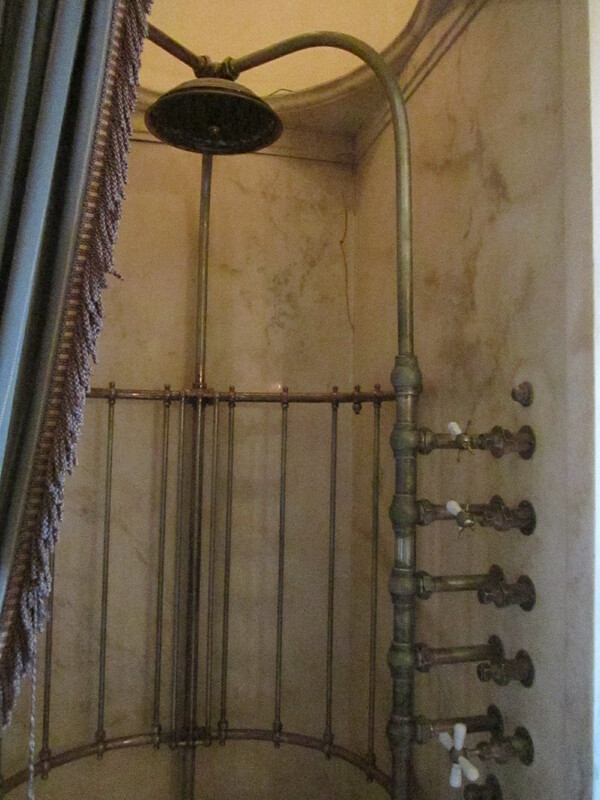 Teddy has been fascinated with all that can be done in the bathrooms TLC designs and builds but the technology has its’ roots long ago – like this shower with body sprays! Amazing! Teddy thought! The home owners would get clean in seconds and it included hot and cold running water! The toilets were similar but not quite 2013 standards. Teddy was sure the amount of water used was much greater than current standards regulate and it didn’t appear to have a soft close lid or seat! Then on to another old home in Hamilton, Canada built in the 1830’s. 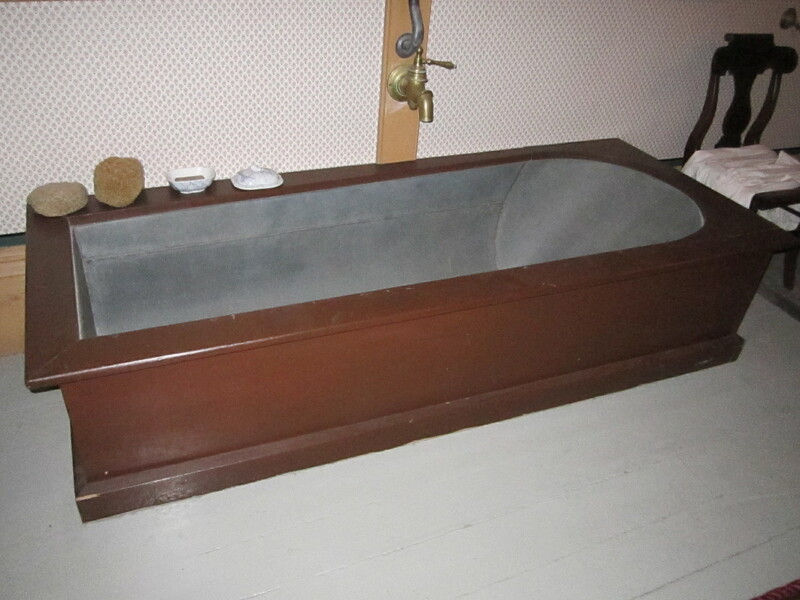 It was very unusual to have indoor plumbing and even a bathtub! Once again it had running water and a drain. Time to get back to Northern Illinois and work. Teddy loved seeing the “technology” from the 1800 and 1900’s but really enjoys the modern technology TLC Construction is able to offer its’ customers. 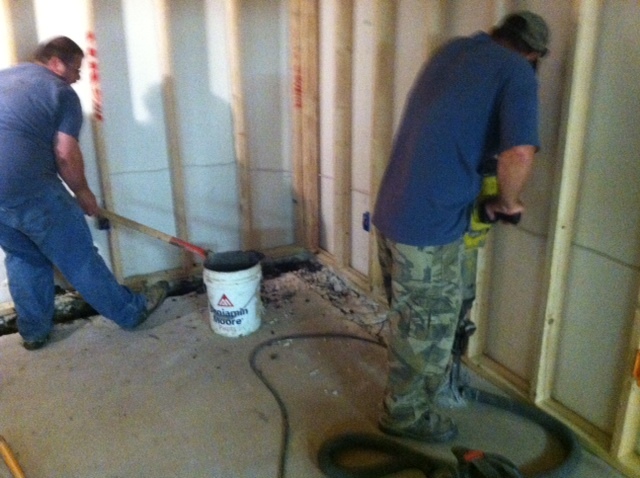 Join Teddy next time to see how the basement build-out is coming along as finish work has begun! 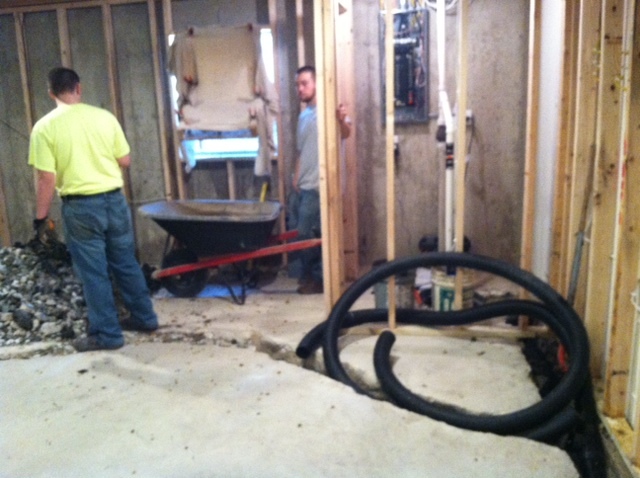 Back to the Basement Remodeling! Things are really moving along – finally – at the basement “build-out” for TLC Construction!” Teddy has been busy watching the water proofing experts add interior drain tile after the April floods proved it was necessary before continuing the project. Last week Teddy reported they were digging a trench to put the drain tile in. What a job trucking the dirt and cement out in 5 gallon buckets; through the egress window to a wheel barrow; then into the truck. Whew! a huge job thought Teddy. Next the water proofing experts got large rolls of corrugated, 4″ plastic drain tile. The drain tile has slots which allow water to enter but it also has a sleeve to keep sand and fine particles from permeating and filling it. They set the drain tile in the bottom of the 12″ trench. The trench goes to the new sump pump and the drain tile enters the sump basket through the side. 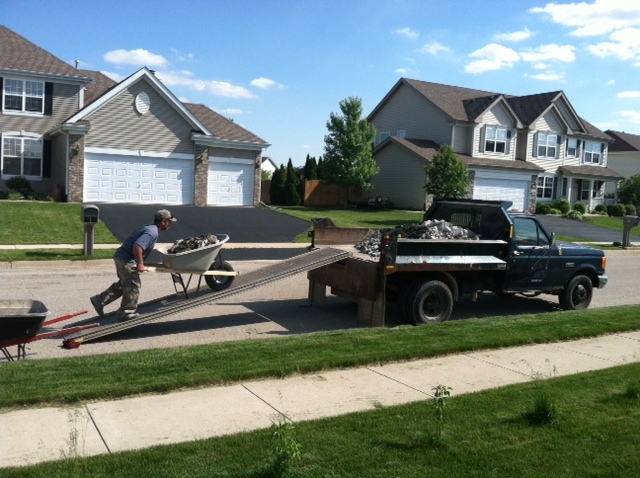 As the drain tile is rolled out into the trench, it is cut to length and covered with 3/4″ gravel chip. Chip is different from other gravel in that all the fine material is screened out thus leaving pockets or voids between the gravel to allow the water to travel freely. Concrete is mixed then poured over the gravel chip and troweled flat to cap off the top of the trench and restore the floor. If a new sump pump is installed, as in this case, the water will be piped up out of the sump bucket and through the side wall of the house just above the foundation. At this point, a pipe is installed to carry the water away from the house much like a downspout for gutters. After the concrete is cured (1-2 days) work can resume to finish the project. Now that this huge project is back under way, join Teddy next time to follow the progress and click this link to check out the NEW TLC Construction website! Several weeks ago Teddy was discussing a TLC Construction basement build-out. (This is contractor talk for building living space in a basement that is unfinished). The halt in construction of the 1,000 square foot remodel lasted a long time. 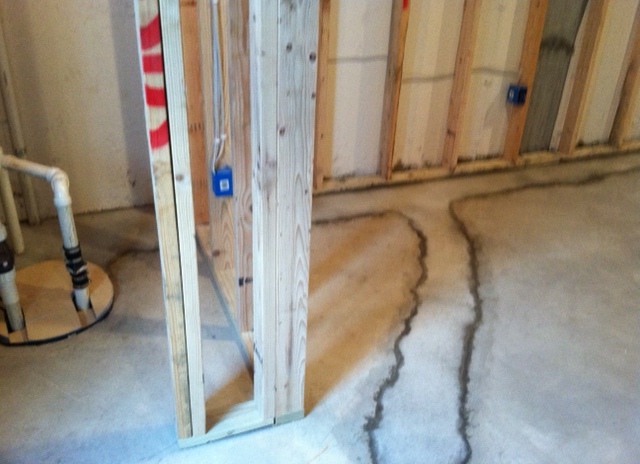 Though the sump pump did its’ job, the heavy rain in April caused water to come up through a few cracks in the basement floor. Investigation revealed the 7-year-old house had exterior drain tile, the basement was “wrapped” but had no interior drain tile. That didn’t work very well in this case, thought Teddy. After more than a month’s delay, the waterproofing experts set up last Friday and started Monday! Unfortunately, the retrofit cost will be more than 15 times the expense of installing interior drain tile during new construction – not inexpensive! Frustrating, to say the least, thought Teddy. 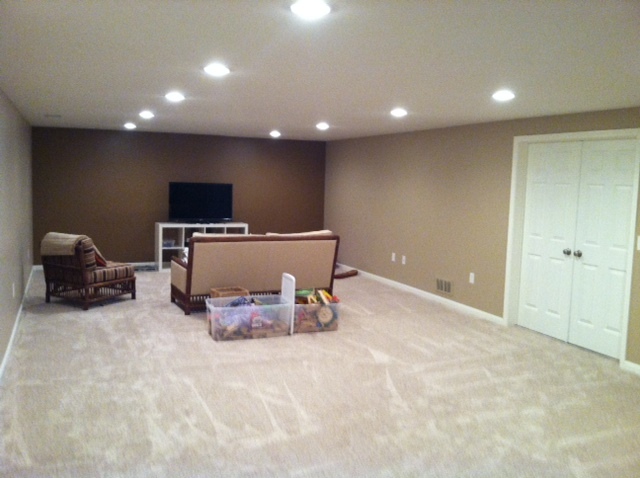 However, the homeowner totally understood that if she wanted to continue the project and create a family room, bedroom and bathroom in the basement, complete with some carpeting, this was an expensive but necessary move. Teddy visited the home several times to watch the process, The water proofing expert had a crew of 5 workers who put down drop clothes and work hard to keep the dust under control. 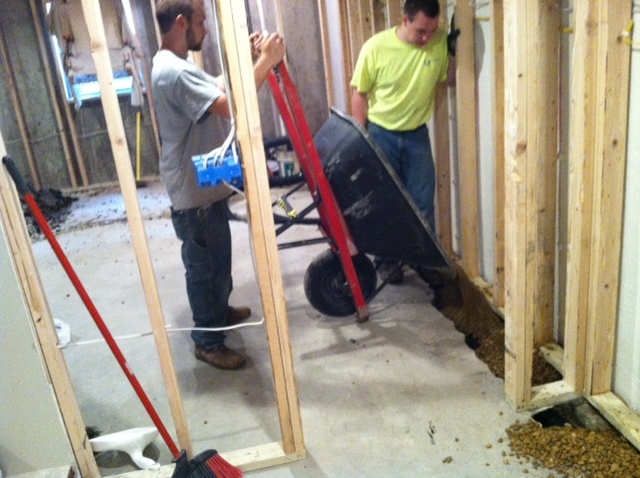 After prep, they began to jack hammer a trench around most of the basement floor and several trenches into the middle of the room where water came through cracks. Once the concrete was removed from the trench, a ditch about 6″ wide and 12″ deep was dug. All this concrete and dirt were put into 5 gallon pails; carried to the egress window; lifted out the window to a wheel barrow; and wheeled to a dump truck. Teddy was amazed at how much work the men were doing! The egress window made it much easier than going up stairs, but still lots of hard work! Join Teddy and the TLC Construction contractors next time to see how the drain tile is installed and the water proofing project completed. In the meantime, check out the new TLC Construction website! Remember – Summer Is Coming! Teddy is frustrated! It was just Memorial Day weekend and the contractors at TLC Construction told him this was the start of summer. Summer! How can it be summer when it is in the 50’s and 60’s, thought Teddy? When will our customers, and us too, be able to enjoy our yards? When will we enjoy our pergolas, decks, patios, screened porches and sun rooms? The TLC contractors told Teddy they get lots of calls from potential customers about changing or building an outdoor structure. What do you tell them? asked Teddy. The TLC contractors explained their process. After the initial contact, they visit the site. They need to check many things including: where the site is located in relation to the house, lot and neighbors; what already exists, if anything; and what they are dreaming of doing. They discuss with the homeowners how they want to use the outdoor structure: do they want to use it year round; is this for family enjoyment, entertaining or both; what is their vision of a major change or remodeling; and other concerns. Following the initial, free consultation, the TLC contractors go to work researching how to turn the dream into reality. They review previous jobs for comparables; consider local codes and restrictions; and creatively evolve the original concept. During all this, they keep the customer’s “proposed budget” in mind. The cost of construction and the complexity of projects are often different from the customers expectations. Join Teddy next time as he goes with the TLC contractors to visit with the potential customers and discuss their proposed project. For now, check out the new TLC Construction website. Just click on the blue TLC Construction to see it! Teddy is sooooo excited he wants to shout! One of the TLC Construction owners has been working with a web designer for several months to develop the “new and improved” TLC website!. It is online and looking good! It has more white space; up to date pictures; and more articles about how the company works. But, Teddy thinks, best of all, you can connect to Teddy’s blog and follow his adventures. How much fun is that! One important thing was to have a website where the TLC owners could add pictures and edit the text. New pictures had not been added to the old website for nearly 2 years! Wow, thought Teddy. TLC has done lots of creative and wonderful jobs in that time! Now future customers can get ideas to help them imagine what their project could include and look like! In fact, you can click on the blue TLC Construction words in this article and connect to the new website! How convenient, thought Teddy. You also will be able to see the owners, John and Jan Bowman, and even pictures of a few of the fantastic subcontractors TLC works with. With customer service and quality work as our main tenants, you will understand how TLC will work with you to bring your dreams into reality. Teddy hopes you will check out the new website today – just click on this link TLC Construction then let Teddy know what you think!